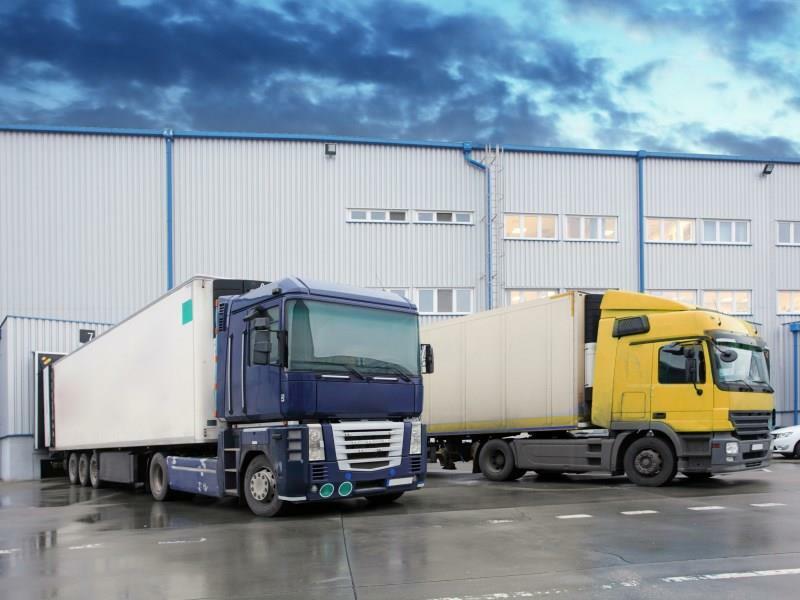 For large convenience store or supermarket chains, the management of product storage, shipping, ordering and receiving would be extremely time-and-labor consuming were it to be implemented by handwritten recording using manual processes. However, advances in bar-coding, communications and database technologies are helping the grocery industry to optimize their stock management and distribution networks with great accuracy and real-time efficiency, thereby cutting associated costs and labor and increasing their competitiveness. For example, in the past, many employees at convenience stores spent a lot of time and labor in receiving, checking and recording newly arrived stock during certain period of time in each working day. Similar labor was expended at the warehouse side when the ordered goods were moved from storage for shipping; warehouse workers have to check orders and move the right items to the right places. Nowadays, most retailing giants have successfully deployed warehouse and distribution system which utilizes automatic identification and data capture technology, such as barcode scanners, wireless LANs and radio-frequency identification (RFID) to efficiently monitor the flow of stock, and thereby eliminate much of the inefficiency and inaccuracy resulting from manual processes. In such applications, employees at warehouses use a barcode scanner to read the barcodes on grocery items which are being moved from storage, and then distributed via an automatic conveyor system according to a compiled shipping list, and forwarded to designated vehicles for transport to a temporary storage locations or retail stores. The scanned data is immediately transmitted to a computer at the warehouse, which is linked to the central database at a back office that monitors how the goods are sent to temporary storage locations or to end retail stores. At the receiving end, retail store employees use their barcode scanners to acknowledge the arrival of newly arrived items and check for consistency. The read data will be immediately stored in the inventory database of the retail store, which is also linked to the central database at the headquarters. Additionally, today's industrial computer technologies are powerful enough to handle multiple tasks other than just management of goods. 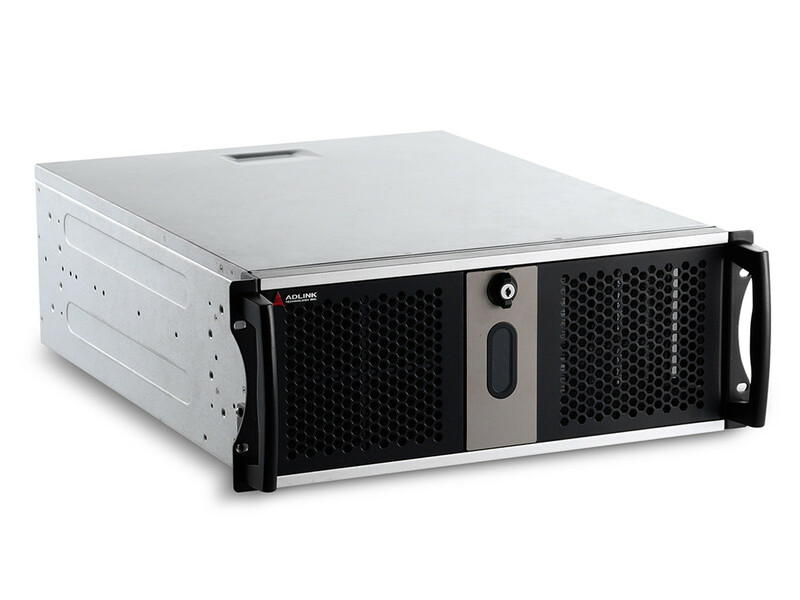 A good IPC with rich I/O and robust CPU performance can support additional functionalities, such as electronic shelf labels (ESLs), digital signage displays and video surveillance in the retail locations, allowing for great flexibility and scalability of application development and maximizing benefits of the system. For such applications as described above, each warehouse and retail store needs to install an industrial PC (IPC) as a controller hub at each location. These controllers are connected to a central server at the back office, sharing the same product data files, so that information updates can be synchronized for real time consistency. In addition to supporting barcode scanners and data storage and transmission, the IPC controllers at retail locations can be used to develop additional applications. For example, the deployment of an electronic shelf label systems, which uses small wireless plastic modules installed on shelves or other fixtures in place of traditional paper labels to display prices and other information—such as discount—on LCD or LED screens as controlled from a back room. This is particularly efficient in a grocery environment—especially that of a large retail chain which often needs to administer thousands of price changes on a regular basis. 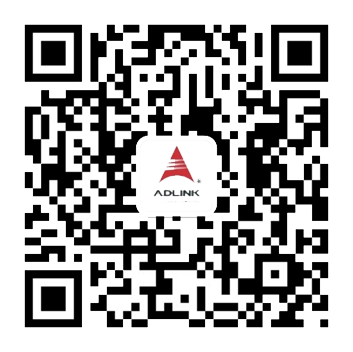 The supply chain and distribution network hub, which can be integrated with accounting/ordering and shipping software systems, radio frequency and barcode hardware, warehouse automation equipment, etc., to reduce inventory and labor costs and allow for higher level of efficiency and accuracy. The system can be optimized when incorporated into the company's enterprise resource planning (ERP) system. ESLs avoid the necessity of store staff walking the aisles and changing the labels on store shelves individually. The ESL system is enabled and controlled by the backend IPC via wireless communications and shares the same price database with the POS system at the frontend checkout counters, which ensure price consistency and avoid disputes arising from pricing discrepancies. The newest technology advancements are lowering the cost of ESLs and the benefits of digital pricing will boost when combined with price optimization software. These new business trends will help to increase the return on investment for the deployment of ESLs and add incentives for installation. In a retail environment, multi-media digital signage that combines entertainment and information is one of the best ways to communicate with consumers. Single or multiple display panels can be installed above checkout counters or in other suitable locations. To maximize the benefits of digital signage, a mini-video camera can be inconspicuously installed in the digital signage display unit to record events in the store in real-time. The recoded images can be transmitted to the controller for storage for security purposes and provide clues or evidence for criminal investigations. 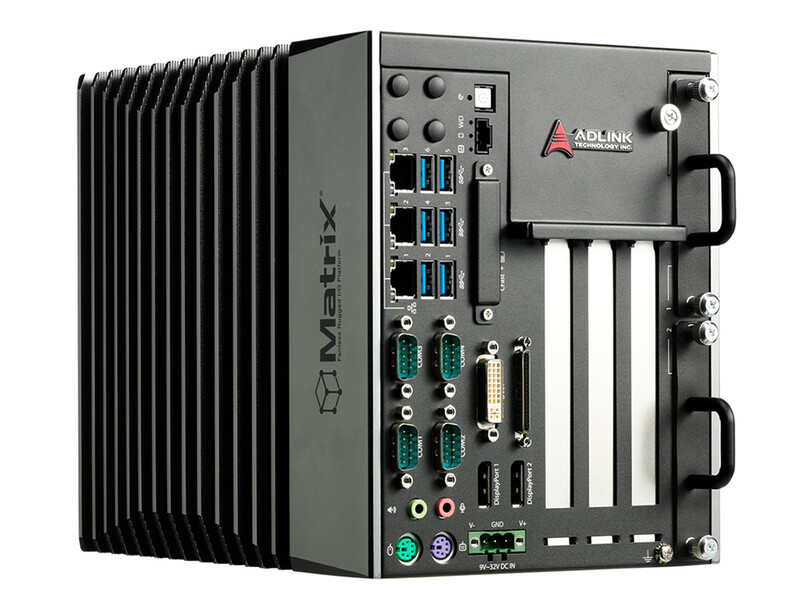 The ADLINK MIX-110 is a small form factor IPC featuring rich I/O and robust CPU performance with comparatively high power-efficiency, suited for installation in a retail environment which often has more limited space for installation but requires more functionality from a single system. 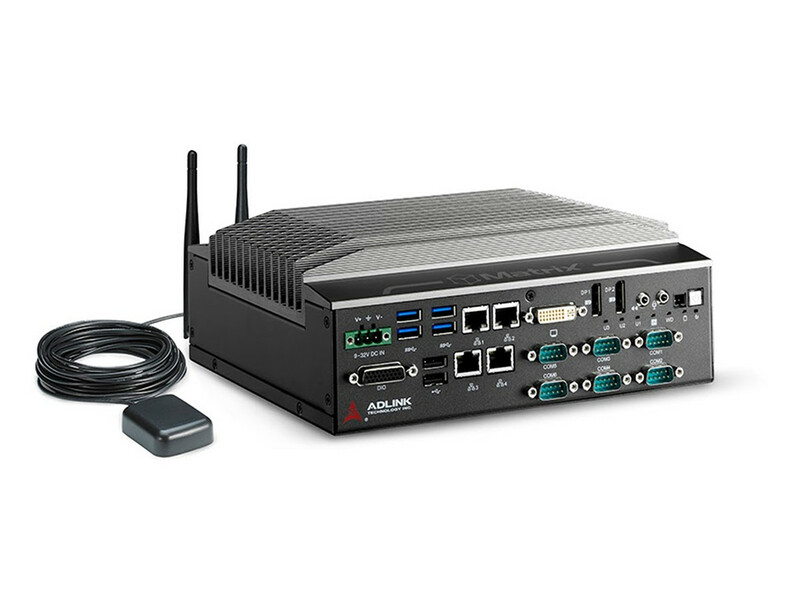 Running on an Intel® Atom™ D2550, the MIX-110 delivers comparatively high computing performance with lower power consumption, supports VGA and DVI-D display output, provides GPIO for RFID application, and has a mini PCIe expansion slot, thus enabling several in-store applications, including bar code scanning, inventory/order/accounting management, multi-media display, digital pricing and simple video surveillance on a single platform. 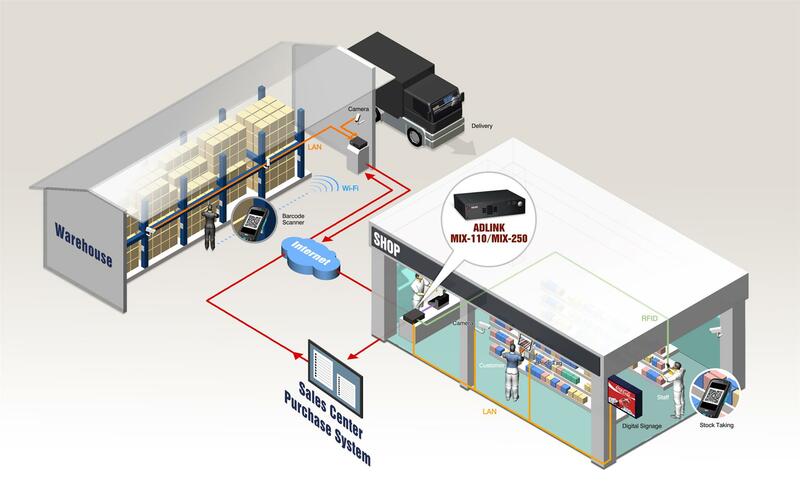 At the warehouses side, the serial COM ports provided by the MIX-110 can be used to enable automation systems—for example, an automated gateway for distributing product items via a conveyor system. The MIX-110 installed at the warehouse enables barcode scanning and automatic distribution systems with a single platform.